It was a sea of blue as DA leader Mmusi Maimane led fellow members and supporters in a march to the Union Buildings to protest against rolling blackouts and alleged corruption in the government. 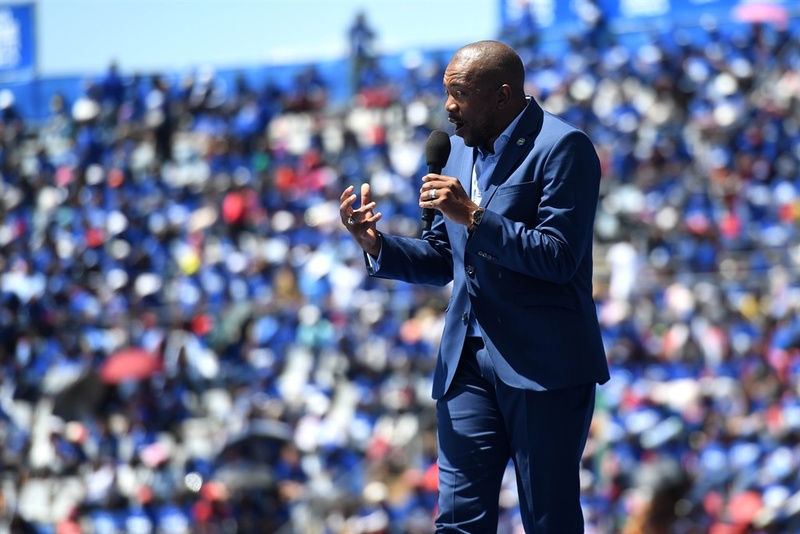 Delivering his speech on the lawns of the Union Buildings on Friday morning, Maimane said the only way to overcome the energy crisis was through unity. "Fellow South Africans, we gather here today in the midst of a national crisis that could affect the future of our country," Maimane said. "If we are to overcome our energy crisis, it will take a combined effort from all role players – business, labour, government, NGOs and regular citizens." Acting as a unified "Team One SA", pooling efforts and resources, and being part of the same solution is "the only way" South Africans will beat the energy crisis, Maimane added. "We can't have everyone talking about different things," he said. Maimane's comments come after recent load shedding, which involved intermittently shutting off power from one area to the next, affecting millions of South Africans. He said load shedding had already decimated small businesses and threatened critical services in communities across South Africa. "I have visited many towns and businesses in the past week and the stories they tell of these power cuts are very distressing." "I spoke to the owners of a manufacturing plant who told me they have already lost too many working hours and cannot pay wages. They will most likely shut down," Maimane said. "I spoke to staff at a hospital who told me that they cannot run critical equipment like ventilators when they only have 30 minutes of backup power available." "I spoke to teaching staff who are worried about children returning from [school holidays] next week. They don't know how continued power cuts will affect the teaching programmes." Maimane blamed the energy crisis on the ANC-led government and said that the power to fix it was with the people instead of "protected politicians". "This energy crisis threatens the well-being of our people and the interests of our nation. And it happened thanks to the looting and corruption of our government and their cronies. It happened because our government, once again, put its own greed ahead of the need of the people they are meant to serve." "We are here to protest the electricity crisis that was entirely created by the ANC government that sits inside this building." "The incompetent boards at Eskom were put there so that ANC cadres could steal. Coal contracts were awarded to ANC and Gupta connected companies. Contracts like the boilers at Medupi and Kusile were awarded to ANC connected companies." "We are here to protest the high cost of living that was brought about by the corruption and mismanagement of our economy by the ANC government that sits inside this building." Maimane said the best opportunity to take power back will be at the ballot box on May 8. "If you don't, then your next opportunity will only come in five years' time, and that may be too late."